Arrival at Hurghada airport, you will be welcomed by our Kasha staff who will meet and assist you. Check in the hotel and over night. Wake up call and buffet breakfast. Enjoy a nice day in the sea. Overnight in the hotel. Early wake up call and buffet breakfast to spend over day in Cairo. Proceed to visit the Pyramids and Sphinx, have lunch then visit Mohamed Aly Mosque. In the afternoon, shopping at Khan El Khalili Bazzar. Back to Hurghada. Overnight at the hotel. Wake up call and buffet breakfast. Spend the day at leisure. Overnight in the hotel. Early wake up call and buffet breakfast to enjoy a glass boat trip foe two hours. Rest of the day at leisure. Overnight at the hotel. Wake up call and buffet breakfast. Morning at leisure then spend the night at Alf Lela Welela where you enjoy dancing and dining. Back to hotel and overnight. Wake up call and buffet breakfast. 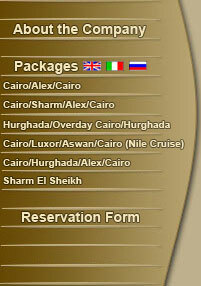 Check out from the hotel then transfer to Hurghada airport for final departure.